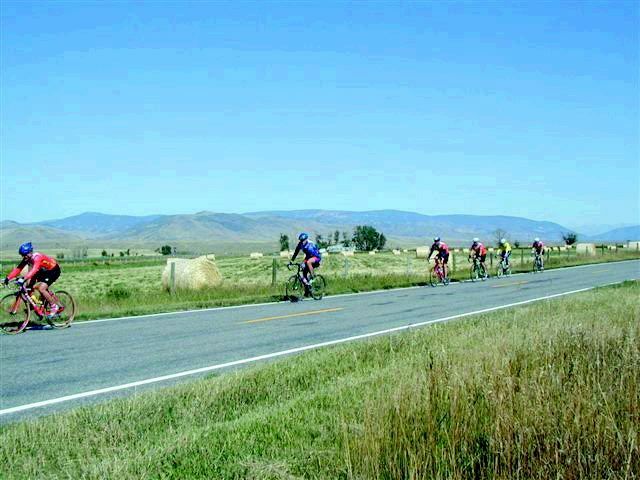 Special to the DailyJohn Carlson, second to right, and other cyclists make their way across the Montana countryside during the Border to Border journey beginning at the Canadian border in 2002. Carlson is not a writer at heart. In fact, he doesn’t have a very rich history with cycling, either.But the part-time Vail resident who works as a high-level business executive in Miami felt inspired to write a book about training for and attempting the Border to Border ride in 2002 when he was 42 years old. The book recounts his summer of riding previous to the trip, including a go at the Beaver Creek Ultra 100-kilometer race, considered one of the most grueling mountain-bike courses, which climbs Beaver Creek Mountain, June Creek, and several other considerable pitches. He also overviews his experience with the Triple Bypass, which passes through the valley every year on its course over three mountain passes from Evergreen to Avon. He grasps the struggle of solo riders doing Race Across America with an anecdote about one rider he encounters who was on the verge of collapsing.Carlson captures the essence of cycling’s intricacies, such as the importance of acknowledging other cyclists on the road – even if it’s only with a quick raise of fingers off the handlebars – the fear of descending on asphalt at increasing speeds, the phenomenon of riding in pace lines and drafting, and just the channeled beauty of one’s surroundings from the saddle of a bike. As for Border to Border, a nonprofit organization created to raise funds and awareness for pediatric AIDS, it was launched by local cyclist Joel Fritz. The Border to Border journey began at the Canadian border in northern Montana with the aim of riding along the Continental Divide 1,900 miles to El Paso, Texas. The purpose was to raise $1 million for pediatric AIDS. There were just a handful of cyclists attempting the journey, along with a sag wagon of helpers and cooks. For those of us who have never ridden our bikes through Glacier National Park or Yellowstone, Carlson paints an identifiable picture of what it’s like to encounter an enormous bison in the middle of one’s path, how it feels to have bears just a few feet away without the safety and protection of a car from which to view them and the chill of a morning mist going up a mountain pass and the discomfort of rain on the descent. Carlson had a journal with him during the trip, thinking from before it began, that it was something he would like to write a book about. “Through the years, people said, ‘You should write a book.’ I was like., ‘What about?’ All of a sudden, I had something to write about. So you ask yourself, ‘Who is this for? Is this a money-making venture?’ You kind of have a blank slate in terms of all those thoughts,” said Carlson from his office in Florida last week. “You realize you’re not going to make a lot of money on it. You decide you’re writing it for your own sense of satisfaction. I just wanted one published copy in my hands.”Carlson views the process of book-writing as something comparable to getting on a bike. There’s really just one person who reaps the full benefits.What’s there to write about?